FileBoss's, file copy routines perform as well as any standalone Windows file copy utility or program yet they use the same convenient interface as all the other of FileBoss's other routines. If FileBoss can not perform a file copy it will give you the option of trying again (such as if you have to close a file that is in use) or just skip the file. Of course FileBoss will log any files that were skipped due to copy errors. And, of course, each option can be applied to files automatically or you can decide on a case by case basis as the file copy process continues. You can tell FileBoss when to ask you what to do if the file being copied already exists. You can tell it to never warn you, or if it has one or more of the following attributes: Hidden, System, Read-only, Archive and even if the file is executable (e.g. has an extension of EXE, COM, DLL, OCX or BAT). Many files stored on CDs have their Read-Only bit set and it is transferred with the files when they are copied to a hard disk. By default FileBoss will detect when files are being copied from a CD or DVD and make sure that the Read-Only bit is cleared performs a file copy. This behavior can be deactivated. It is a global setting that affects all files copied by FileBoss from CDs (e.g. the setting also affects files copied using Drag & Drop and to Drop Zones.) To change whether or not FileBoss removes the Read-Only bit on files copied from CDs select Options > Program Options... from the main menu and select the 'Copy Files' panel then check or uncheck the 'Clear Read-Only bit when copying files form CDs/DVD' box. Will copy files that are selected if, and only if, a file with the same name already exists in the destination folder. This effectively updates the files in the destination folder without adding any new files. Good for when you want to back up files without batch copying junk or temporary files that may be on the source drive or folder. The first four options determine whether or not files can be overwritten by the files being copied. When Only if Newer is selected the times the files were last modified are used for comparison. Rather than overwriting files that exist, you can instruct FileBoss to rename either the new or the existing files. Select New File to rename the file that is being copied (the existing file will not be changed). Select Existing File to rename the existing file, the new file will then be copied using the old name. Whether you choose to rename the existing file or the new file depends only on what you are doing and your personal preference. Click on Set... to specify how the files - either new or existing - will be renamed. You can add text and/or sequential numbers to the new filenames. 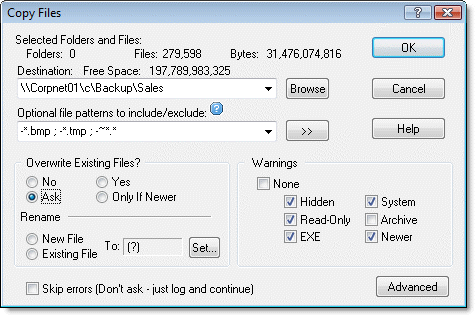 These options affect files created or overwritten by the copy files or move files operation. You can add, remove or leave the four attributes unchanged. If an attribute is marked as No Change it will be set to the same setting on the source file or folder. These options affect files created or overwritten by a copy file or move file operation. All new and overwritten files will have their file times set to the time the copy / move operation began. All new and overwritten files will have their file times set to the time specified in the date and time fields immediately below these three option buttons. All three file times - Created, Last Accessed and Last Modified - are set by these options. Frequently the file times of the copied files will not exactly match those of the original files or of the time specified. When this happens it is because how Windows stores file times depends on the Version of Windows and on the underlying file system of the storage media, e.g. NTFS and FAT. Just as one example some systems store access times to the nearest two seconds others to the nearest day. So In that case when a file is copied from the former to the latter, the access time will be rounded down to midnight of the day. Then, when the file times are compared they will be different. FileBoss can account for this difference by setting the resolution of file times when in compare mode. These options determine when FileBoss will alert you that a file is going to be overwritten by the copy or move process. The warnings are fired when an existing file has one of the checked attributes. For instance if the EXE box is checked FileBoss will ask you what to do before copying a source file over an existing target file that has an extension of .EXE, .COM, .DLL, .DRV, .OCX or .BAT. When asked what to do your options will be to skip that one file, cancel all remaining files, overwrite that one file, overwrite all remaining files or even rename the file. This is a master check box that, when checked, turns off all warnings. You'll note that when it is checked the other check boxes are grayed indicating that they have no effect. To enable the other check boxes uncheck this 'None' check box. FileBoss will stop and ask permission whenever one of these attributes is set on the existing target file. Note that changing (which overwriting a file certainly does) any file with the Hidden, System or Read-Only attribute may disrupt the stability of your system, if not render it totally unusable. The archive bit indicates that a file has been changed. This attribute for a file is set by Windows whenever a file is modified by either Windows or a program such as a Word processor or paint program. Backup programs often use this attribute to determine what files need to be backed up and, after backing up the file reset (clear) the Archive bit. FileBoss considers files with the following extensions to be executable files: .EXE, .COM, .DLL, .DRV, .OCX and .BAT.